All 18 Lands' End promo codes have been verified and tested today! Every one of your purchases will earn you Reward Points, which can be used for cash back, store rewards and more. You’ll earn Rewards on every qualifying purchase made at Lands’ End. When checking out online, just make sure you enter your Member Number and PIN during the checkout process. Having any issues? Contact support at 1-800-963-4816 to get help! You can get everyday free shipping at Lands’ End as long as you spend at least $50 on your order. With all of the items and savings at this retailer, that’s certainly not difficult to do. So if you find yourself a few bucks short of $50, add another item or two – it’ll pay for itself! 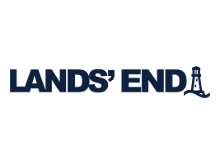 Lands’ End always has great savings and discounts on top clothing, footwear, accessories, and home goods. To browse all of the items on sale, just click the red “SALE” link on the far-right of the Lands End navigation bar. Then, you’ll be able to filter by product category, clearance items, price, and more. You’ll find savings of up to to 60% or more. Can’t get enough Lands’ End savings? A great way to get even more discounts is to sign up for SMS messaging at Landsend.com. To do so, just head to the Lands’ End website, and scroll all the way to the bottom of the page. Enter your phone number in the “Join our SMS texting list…” text field. You’ll be sent exclusive discounts and promotions. Up to 8 messages per month will be sent, and you can cancel your subscription at any time. If you’re a loyal Lands End customer, there are a few different ways you can make sure you stay in the loop, and see all of the latest fashion releases. The easiest way to do so when shopping online is to simply click the “NEW” tab on the main navigation menu. You can shop new collections, and choose subcategories for Men, Women, Girls, Boys, Home, and more. You can also request a physical catalog, and browse online “E-Catalogs” to see what’s new. To do so, just scroll down on the Lands’ End website. Then, click “Catalog Requests” underneath the “SERVICES” link. Here, you can browse digital versions of the latest catalogs, and request a physical copy of each one, if you’d like. At Lands’ End, you can save big at any time of the year. Whether you’re shopping for swimsuits in the spring and summer, or cozy coats and throw blankets in the chillier months. Can’t find a Lands’ End promo code you’re interested in using? Hoping for a bigger discount? One of the biggest Lands’ End coupons you can get is for 40% off a single full-priced item. How do you get it? Just sign up for the Lands’ End email list. The first time you visit the website, you’ll get a pop-up offer asking you to sign up – and offering this amazing Lands’ End coupon code to entice you to do so. Missed the pop-up? Don’t worry. Just scroll to the bottom of the page. Find the text field that says “Join our mailing list…” and enter your email address. Click the adjacent “SIGN UP” button, and you’ll be good to go. You should have your coupon in your inbox in just a few minutes. So, you’ve found a Lands’ End coupon to use, but you’re not sure how to redeem it. Need help? Here’s what you’ll need to do. Sometimes, a Lands’ End promo code will be automatically applied when you add an item to your cart. If this is the case, you won’t need to enter a code. But to confirm that the code has been applied properly, you can look at the “Promotion Savings” section of the Order Summary, to make sure everything looks correct. Lands’ End is well known for having one of the best return policies of any retailer. Its policy is simple. Guaranteed. If you’re not satisfied with your item, return it to the store at any time for an exchange or a refund. To do so, you have a few different options. First, you can bring your items to any Sears store, along with the packing slip. Your return will be processed, and a refund issued in 2-3 days. You can also use the Easy Return label included with your order to return your items. Attach it to the box, and drop it off at a USPS center. A $6.95 shipping fee will be deducted. However, you’ll get free shipping if you return an item and re-order it in a different size or color. You can call 1-800-963-4816 to have your shipping fee waived. If you purchase an item from Lands’ End, and it goes on sale for a lower price, you can get a refund for the difference upon request, up to 14 days after your original purchase. To get your price adjustment, you must call Lands’ End customer service at 1-800-963-4816, and provide information about your order and receipt. Your refund will be issued to your original method of payment. Note that the price adjustment policy does not include adjustments for Lands' End coupons. For example, if you bought a $100 item with a 40% off coupon, and it goes on sale for $50 without a coupon, you can’t use a Lands’ End promo code to save more. You will be refunded $10 – the price difference, coupon included, between your original purchase and the current sale price.